The AMI Montessori Classroom is much more than just a classroom, it is an educational community of individuals who must work together on a daily basis. From a student's first day in a Montessori Primary class, they learn they have a responsibility to themselves and others. Initially guided by the teacher, students hold meetings, express their opinions and are allowed to make collective decisions. They learn to be critical and fair decision-makers, make compromises and recognize the need for individuals to work together cooperatively. This process becomes more and more advanced as students move forward in the Montessori program. Classrooms become working democracies that help our students fully understand their role as a citizen. Our older students recognize that we are a community within a larger community; we are all citizens of our world, and have obligations to behave in compassionate and caring ways. We introduce the concept of community service by asking ourselves, "How is my school community doing? What can I contribute to make this a better place?" We have older children going into the primary classrooms to help with art projects and reading. We do work to care for our grounds and gardens. We try to be thoughtful and caring to all members of our community by learning to observe and make decisions about what would be a useful contribution. In a larger scheme, each school year brings different opportunities. For example, when hurricane Katrina hit the Gulf Coast, the Elementary children of Riverstone decided to organize what they called a "Combo-A-Thon" in which children could do a variety of activities to earn money to donate to the Red Cross. They ran laps, shot baskets, did jumping jacks, etc. in order to earn money for the number of activities completed. 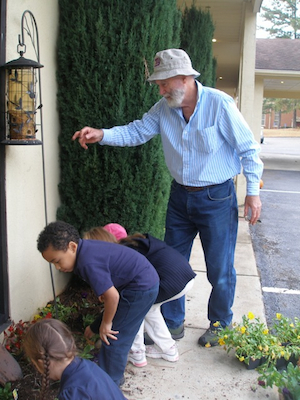 On a beautiful fall day, the children of Riverstone Montessori raised $2,300 for the survivors of hurricane Katrina. Our Adolescent Program students are at an age when they are developing conscious habits that may last a lifetime. We believe that developing the habit of philanthropy is important. All Adolescent Program students choose projects to become more formally involved in. In 2007-2008, Riverstone Montessori Adolescent Program students gave back to their communities by helping with tornado relief after the tornadoes struck downtown Atlanta, they monitor local lakes for water quality and started a recycling program on campus. Environmental awareness is as important as Community service. It is our goal as a school to become increasingly environmentally aware. Recently, our Adolescent Program Students established a recycling program that is available to the community and have designed a composting program. We would also like to investigate the ways in which we can decrease our CO2 emissions as a school. Stay tuned!